I continue to be impressed with the peaks of the Dix Mountain Wilderness Area of the Adirondack Park. Not just those that are part of the 46er high peaks list, but also many of the peaks of lesser stature. Nippletop Mountain is one of those. It is a bushwhack hike to reach the summit, but not a difficult one. My wife Leesa was willing to go with me. She’ll usually be game as long as the distance is not extreme and the maneuverability through blowdown and vegetation is expected to be manageable. She trusted my judgment! 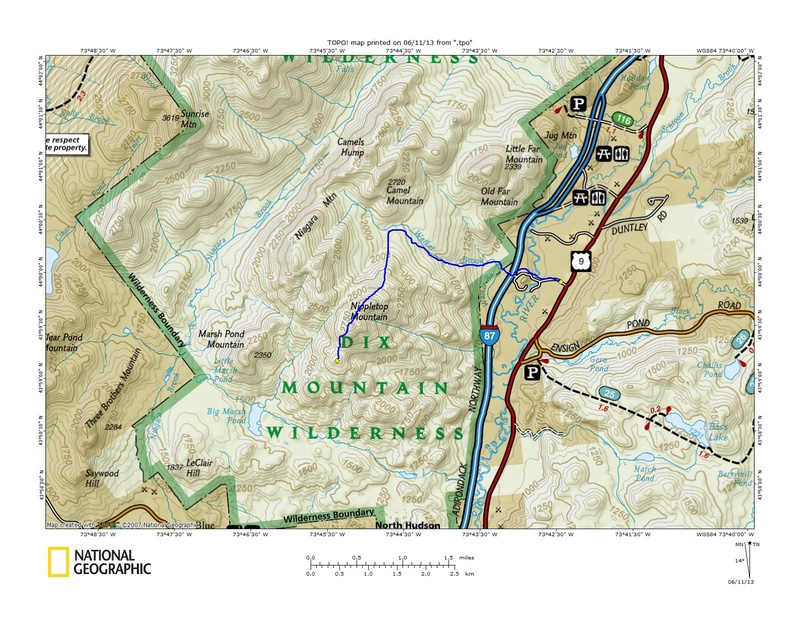 This trip would start from Route 9, 3.4 miles north of Blue Ridge Road where private land owners have granted access to hikers via a jeep road that leads to a culvert under I87. We parked alongside Route 9 since we have a low clearance vehicle. After 5 minutes walk, the jeep road forks and a sign directs hikers to the right where you have to ford the Schroon River. Bring your water shoes, or garbage bags because the water is usually higher than boot level. On this day, after having had lots of rain, the water was about knee deep. We had brought our water shoes and they worked fine for the crossing. Once across the river, we went to the right. There is a myriad of jeep trails on the west side of the river, between the river and the highway. The trick is to find the culvert passing under the highway. It was about a mile from the car to the highway culvert crossing. Once under the highway and on the west side of I87, there is a herd path that leads straight ahead. We followed that for a few minutes until we reached the banks of Walker Brook where the herd path crossed the brook. Again the water was above boot level so we used water shoes. You could probably scout and find a way to rock hop, or a log for crossing. 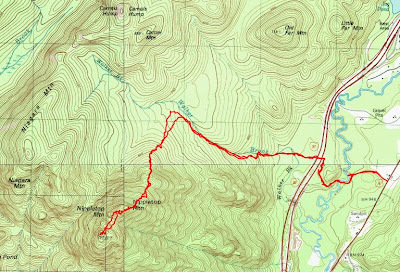 Once across Walker Brook, there is a very well defined herd path that essentially follows the south side of Walker Brook. We followed this path for 1.4 miles before it was time to turn SSW and begin the bushwhack portion of the hike. At this point we had walked 2.4 miles and climbed 800 feet. The climb to the northern summit of Nippletop Mountain was only a one mile bushwhack; generally through hardwoods. There was nothing very complicated about it and no big obstacles to maneuver around, but we did climb 1100 feet in that mile. The northern summit is really cool. It is a large summit and has lots of open ledge interspersed with small clumps of trees and scrub. There is also one really large glacier erratic approximately in the center of the summit. There had been a few mosquitoes after us on the way up, but there was a good breeze on the top to keep them away. It was pretty comfortable and probably close to 70 degrees. Leesa choose to stay at the north summit while I headed for the south summit (true summit) with our dog, Rev.I gave her one the radios so we could stay in contact.There is a small col between the two summits.Rev and I dropped about 100 feet before climbing towards the south summit.The terrain was a little more rugged and we had to scout around to find a way around some cliffs.We went to right and were able to manage.Leesa and I could see each other at various times.Once on the true summit, we were able to wave to each other and easily see from one peak to the other.It only took Rev and I about 20 minutes go travel from the north summit to the south summit. The south (true summit) is about 50 feet higher.It has open rock with great views, but it has a smaller summit cone.There are 360 degree views.I thought the northern summit was more interesting, but they were both fantastic. I spent a few minutes on top, then went back to Leesa then we stayed on the northern summit to have lunch. On our descent, Rev led the way; easily following the scent from our earlier climb.It took about an hour to get back to the Walker Brook herd path and then another hour to walk back to the car.Walker Brook had lots of water due to recent rain, so it was enjoyable walking alongside it on the way in and out. Niagra and Camels hump are also a very rewarding jaunt if you haven't ventured that way yet. Hey Jeff - Yes I have. I've done quite a few in that area and most are really nice.